A chord progression is a succession of musical chords (with at least two notes) played one after another. Chord progression can be named harmonic progression and represent the foundation of western and traditional music. Many jazz standards use similar chord progressions, in different keys it is very important to recognize them by ear and visually. Working and practicing basic chord sequences will make you feel more comfortable when you will need to learn jazz standards, it will more evident and easy to comp and solo. In this lesson you will learn to recognize the 14 most important jazz chord progressions as minor and major II-V-I, the turnarounds and their variations, how to use passing diminished chords. You will find charts with roman numerals to easily transpose these harmonic progressions in different keys and some examples of comping with audio files, tabs and standard notation. What's the major ii-V-I sequence ? It is obvious that the first chord progression to master is the major II-V-I sequence (A.K.A 2 5 1). It is the most used chord progression found in jazz music. The II-V-I cadence contain three basic chords built from the first (I), second (II) and fifth (V) degree of the major scale. Each degree corresponds to a chord, it means that we will play a minor seventh chord on the degree II, a dominant seventh chord on the degree V and a major seventh chord on the degree I. Which makes in the key of C major Dm7 (II), G7 (V) and Cmaj7 (I), three four-note chords built by stacking thirds. You can find the ii V I progression with two chords per measure. The first example uses two basic drop 2 chords (Dm7 and Cmaj7 on the II and I degrees and a G7 drop 3 voicing on the V.
This second example has extended chords. Dm11 instead of Dm7 and G9 in place of G7. It is common to see II-V-I with two chords per measures, generally the ii and the V are played in the same bar. In this example the minor and the dominant chords are extended with a ninth. SUMMERTIME (A-7, D7) Sometimes the II -V doesn't resolve to the I. AUTUMN LEAVES (A-7, D7, Gmaj7). TUNE UP (E-7, A7, Dmaj7). How to alter the V chord of a ii-V-I progression ? As seen previously, the II-V-I progression is quite easy to play and ear. It is a nice introduction to jazz comping. However, only playing notes of the diatonic scale can be boring in the long run. The next step in exploring the most important jazz chord progression is to consider the V7 as an altered chord (Valt or V7alt). It means that we will add altered notes not present in the original scale (the major scale). These altered notes are b9, #9 #11 (b5) and b13 (#5). This will create tension, an imbalance of the V7 chord which should resolve to the I chord to release this tension. The new progression is now ii-V7alt-I. Here are a few suggested shapes to play dominant altered chords on the guitar. In this example, we can see that the V is altered with the b13 (Eb) which resolve into the major third of Cmaj7 (E). In this second example the V has an altered fifth in the bass, which resolve to the root of Cmaj7. This creates a descending chromatic bass line (D, Db, C) from Dm11 to Cmaj. Try to create your own II-V7alt-I rhythm patterns using the guitar voicing diagrams presented previously. Try to apply this progression to the jazz standards that you are used to playing. Remember that the V7alt must resolve to the I chord. What is the minor ii-V-I cadence ? The minor ii -V-I progression is equivalent to the major II-V-I, but in a minor key. We found this sequence in many jazz tunes as Autumn leaves, Blues bossa, Black orpheus. As the major II-V-I, the minor II-V-I is generally built on the II, V and I chord of the harmonic minor mode, but can also derive from the melodic minor mode. The chords are m7b5 (II), 7alt (V) and minMaj (I). The latter one is most of the time replaced by a minor 7 chord because it is a little bit dissonant. Jazz standards or bebop tunes in minor keys are pretty rare however, there are often minor II-V-I cadences inside the tunes. Here is a C minor II-V-I sequence illustrated with three chords : Dm7b5 (II), G7b13 (Valt) and Cm7 (I). This second example has an altered chord on the V degree, G7b9b13. What is a turnaround ? Turnarounds (also known as turnbacks) are most often used during the last two bars of a piece to bring us back to the tonic, but it should be pointed that they can be used in many situations particularly into rhythm changes for example. Let's go with the basic form of the turnaround. It is made of the I - vi - ii - V degrees of the major scale giving the following chords : Maj7 (I), min7 (VI), min7 (II) and Dom7 (V). It means that in the key of Bb, we get Bbmaj7, Gm7, Cm7 and F7. What's the rhythm changes turnaround ? The most known turnaround variation is the Imaj7-VI7-ii7-V7 chord progression. The iim7 chord is changed into a dominant chord (V7). This progression is a part of what we call "rhythm changes". The basic rhythm changes is a 32-bar AABA form, but there are many variations. Its name stems from the George Gershwin tune "I got rhythm". We find this sequence on bars 1-2-9-10-25-26 and generally a variation (iiim7-VI7-iim7-V7) on bars 3-4-7-8-11-12-27-28 with a diatonic substitution. Imaj7 is replaced with iiim7. The most commonly used key to play in is Bb major, which is the key we are focusing on in this lesson. 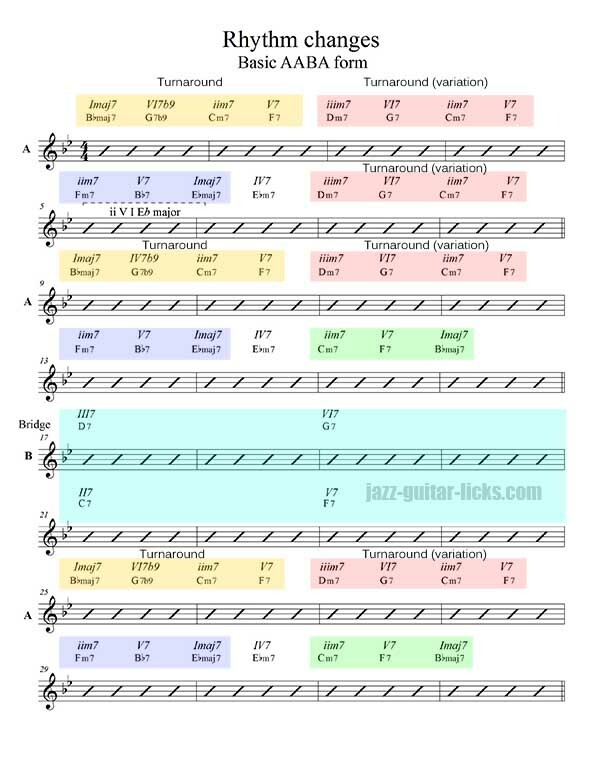 To help you understand the role of the turnaround, here is a common rhythm changes sheet in the key of Bb with a chord analysis and a color code. Blue - Ebmaj7 ii-V-I - Ebmaj7 is the IV of the Bbmaj7 the original key. To help you get hear this classic progression here is a list of rhythm changes tunes . This first example shows you how a Imaj7 - VI7b9 - iim7 - V7 chord progression can be played using drop 3 chords (Bbmaj7 and Cm7) and drop 2 chords (G7b9 and F7).It's in the key of Bb. Please note that the V chord can be altered. What's a diminished passing chord ? In this variation we will introduce a diminished passing chord between the Imaj7 and the iim7 chord in place of the VI dominant in order to obtain a nice interesting chromatic bass line. That would give in the key of Bb : Bbmaj7 - Bdim7 - Cm7 and F7. Jazz chord progression # 7 - Turnaround variation - iiim7 - VI7b9 - iim7 - V7. There are many versions of the turnaround, one of the most used is when the III chord is played instead of the Imaj7 chord. In the example below, Bbmaj7 is replaced by Dm7 thus giving a new sequence iiim7 - VI7b9 - iim7 - V7. You can find this variation on bars 3-4-7-8-11-12-27-28 of the previous rhythm changes sheet. To add more interest to this progression and make the pull back to the I chord you can alter the V with a b9 or a b13. In this variation the iiim7 and the iim7 are changed to III7 and II7 thus generating a chain of dominant 7 chords to produce a sense of instability. The sequence is now III7 - VI7(b9 b13) - II7 - V7alt. Please note that you will maybe need to alter the III chord to fit with the melody. Please note that you can find this progression in the bridge of rhythm changes on the condition to play two chords per bar. How to use tritone substitutions when playing a turnaround ? Now that the iiim7 has been turned into a III7 we can apply the tritone substitution referred to as the dominant chord substitution. The basic use the tritone sub is to replace the V with a dominant 7th chord whose root is a tritone away. Example with D7 (V), which can be replaced by Ab7 a tritone apart (three whole-steps). So the previous progression (D7-G7-C7-F7) would become Ab7 - G7 - C7 - F7 (bVII7 - VI7 - II7 - V7). We can also use a tritone substitute for F7 (V). Thus giving a B7 (#I7), then we get two chromatic movements between Ab7b5 and G7b13 and between C7#9 and B7. If we keep the III7 chord and use a tritone substitution for G7 (VI7) we get an interesting chromatically descending line : D7-Db7-C7-B7. How to incorporate a turnaround into a jazz blues progression ? The I7-VI7-iim7-V7 sequence is an essential component of jazz blues. It is placed at the end of a classic 12 bar blues, this is a great way to return to the beginning of a jazz blues progression. The turnaround is generally accompanied by the same sequence, but rolled out over four bars instead of two measures. We can find this sequence on bars 7-8-9 and 10. 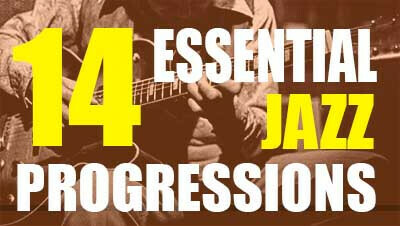 Obviously, there are many different jazz blues progressions. Here are some chord voicings to illustrate a Bb blues jazz progression. You can see that a diminished passing chord has been added. It is an E diminished seventh chord (#IVdim7) used frequently in bar 6 of blues jazz tunes. Try to apply the blues, jazz turnaround to the tunes you used to play. The I7 - IV7 is surely the first progression a guitar student learns to play, so obvious that it is often neglected. However, it is present in many jazz tunes through different types. The first example is an essential part of the blues, dominant I chord chord moving to a dominant IV chord. Another example of movement by fourths is the bridge of rhythm changes, previously seen in this lesson. The bridge involves playing four dominant chords a fourth apart, sometimes referred to as circle of fourths. That's what the bridge of a rhythm change in the key of Bb looks like. Four chords a fourth apart. What 's the "take the A train" chord progression ? The "take the A train" progression takes its name from the most known Duke Ellington tune. This progression includes a II7 chord that goes to iim7 starting point of the major II-V-I sequence. You will see the movement IMaj7 - II7 - iim7 in many jazz tunes as The girl from Ipanema, Desafinado (Carlos Jobim). How to connect chords with diminished 7 chords ? Using diminished chords to connect the Imaj7 with the iim7 and with iiim7 is an usual and very important device that will help you add harmonic interest to your playing. The principle is quite easy to understand, you just have just to introduce diminished chords between the Imaj7, the iim7 and the iiim7 of a major I, ii, iii chord sequence. These diminished chords are located a half-tone above the target chord. This way you will create a chromatic bass line (C, C#, D, D#, E). Example in the key of C major. If you take a look at the tune "How insensitive" you will see a nice example of how to use diminished passing chords in a descending movement, between the iiim7 and iim7 then iim7 and Imaj7. You have understood that diminished passing chords are mostly used to connect other chords and useful devices to work on chord/melody. What's the IV to iv chord sequence ? The IVmaj7 - ivm7 progression can be found in many jazz tunes as All of me (bars 25-26, F and F-) and All the things you are (bars 25-26, Dbmaj7 and Dbm7) and also in a number of popular songs. Here are the last eight bars of "All of me" to illustrate the IVmaj7 - ivm7 sequence in jazz music. This jazz guitar lesson is about the backdoor progression, a chord sequence found in many jazz standards. Unlike a classic II V I resolution, it approaches the tonic chord from a dominant chord which is a tone below the root. How to play a major 7th arpeggio over a dominant 7 chord. This guitar lesson explain this nice trick used by number of jazz guitar players to add smoothness to their jazz guitar lines. This video is about a Barry Galbraith comping study named Like someone from the book "Jazz guitar comping series, vol #3" published by Jamey Aebersold. It soooo simply, yet so complex at the same time and that is the beauty of jazz! Thanks again for this beautiful article - much appreciated!